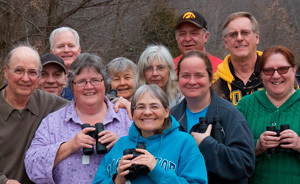 Birdwatching Dot Com is about wild birds and the sport of birding. It's for everyone who's interested in bird watching and enjoying nature. Enter coupon code to take $150 off usual price! New version Bird Brain 7.3 is now available! You can download a FREE TRIAL. Bird Brain is a birding database for Macintosh computers. Use Bird Brain to record your sightings and keep your life list, photos, QuickTime movies, notes, and other files. Enter any amount of information with each record. Bird Brain makes all kinds of life lists. It creates checklists and target lists for 200 nations and any US state or Canadian province. Nearly any bird report you can want, Bird Brain will create. We can do a custom import of your AviSys data to Bird Brain for $20. We like the Vortex Diamondback. It's our best -selling binocular, and it sets the standard for good, reliable optics in the medium price range. It comes with a lifetime no-fault warranty that actually covers accidental damage! 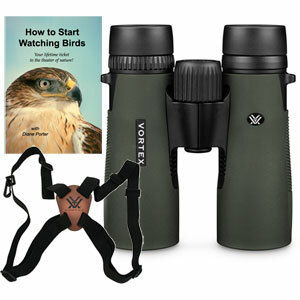 Limited-time offer: With each 8x42 Vortex Diamondback binocular you purchase from Birdwatching Dot Com, we'll include a free Vortex Harness and our birding DVD, "How to Start Watching Birds." $219.99. In her Fairfield, Iowa, yard, Meg Earsley saw a Dark-eyed Junco that had "Wait a minute!" written all over it. Some of this bird's feathers are missing their normal pigmentation, causing white patches where you would expect to see dark gray. This condition is called "leucism." While it is not considered rare, it's not something a birder sees every day. Thank you, Meg, for permission to share your unusual photo with visitors to Birdwatching Dot Com. Here are the essentials for a successful start in bird watching. We offer several Birdwatching Starter Kits at a range of prices. 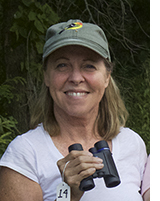 A great favorite is the Better Birdwatching Starter Kit, with a Shrike binocular, a field guide to help you identify the birds you see, and our own DVD, How to Start Watching Birds. A yellow band across the end of the tail shouts Cedar Waxwing. 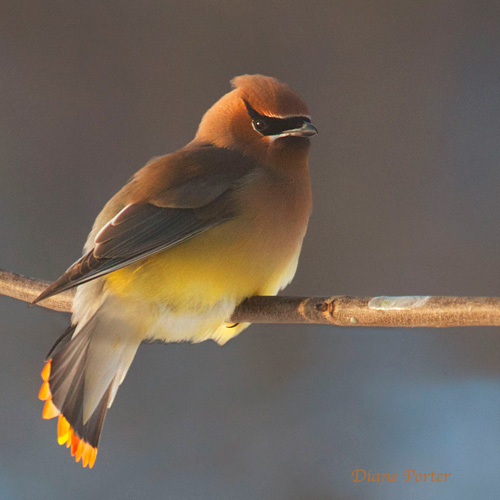 A few Cedar Waxwings, like this one, show orange instead of just yellow in the tail. Maybe that makes them the superheroes of carotenoids. Maybe they get to be the waxwing king or queen of the prom. To see more episodes of This Morning Outside with Diane, click the picture matrix. 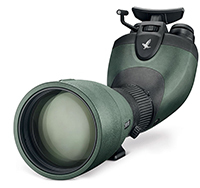 The new Swarovski BTX Ocular Module lets you see through a superb spotting scope while using both eyes! Your brain is designed to compare images coming from two eyes to construct what you see. Using two eyes makes the image more real, richer, and more natural. Michael and Diane give a guided tour through this new and revolutionary optical product. We review 14 pocket binoculars. Prices range from top end to dirt cheap. 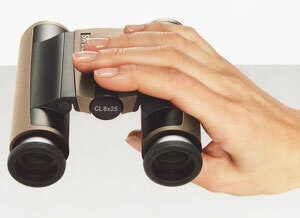 Individual reviews of 10 noteworthy binoculars. This review originally appeared in the January 2018 Bird Watcher's Digest. There's a bewildering number of tripods and heads. So we studied and tested them. Here are the best solutions for birders. They range from affordable aluminum to top-line Gitzo carbon fiber. Each matched to the right head. Something for every price range. Gifts for birdwatchers. Many specials and closeouts on great binoculars. Our pick of the best high-quality bargain spotting scope. Feeders and birdbaths for a backyard bird oasis. Read how the judges rated each affordable binocular. And how to audition a binocular for yourself. Here are links to our reviews of compact binoculars of a variety of prices, and an overview of what a birder hopes to find in a good pocket binocular. Swarovski's new pocket binocular is good enough to use as a birder's full-time binocular. See Michael and Diane's hands-on review. Since our 2015 Titans review of the top Leica, Swarovski, and Zeiss binoculars, all three manufacturers have brought out new models. Michael and Diane Porter do a hands-on, side-by-side comparison and report on the 2016 Swarovski EL with FieldPro Package, the 2016 black Zeiss SF, and the completely new-in-2017 Leica Noctivid. In the Birdwatching Dot Com store, we offer bird feeders, bird baths, and bird houses. These are things to transform your backyard into an oasis of wildlife for you to enjoy. You'll find squirrel-proof feeders, hummingbird feeders, and various artistic feeders. Get a birdhouse for your wrens, or attract purple martins with purple martin gourds and houses. 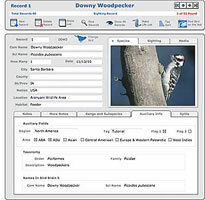 We have birding DVDs and audio CDs, birding software, binoculars, scopes, and tripods for every need and every budget. Let people know about Birdwatching Dot Com by putting our bird button on your site.